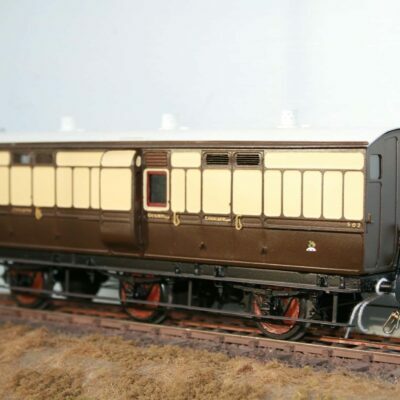 This “O” gauge GWR fitted “Tevan” 6T. Dia.V32 Insulated Van running number 105804 in matt white livery was built & painted from the Parkside Dundas kit (ref. PS48). It is in very good running order with Slater’s spoked wheelsets set in axle boxes with vertical movement. It is in as-new little-used condition with sprung buffers and scale couplings (please note three link couplings currently fitted). Original box for storage/transportation.